Sometimes fate, and the games release schedule, align in strange but perfect ways. A week ago I reviewed Grand Prix Rock’N Racing which I gave 1/10. I didn’t enjoy doing that. The game wasn’t cheap and cynical, it had some kind of heart behind it. But it was so abjectly poor that the score made sense. Even more so when you see that it contains the same flaws as the Xbox One version that was slated by reviewers earlier this year. 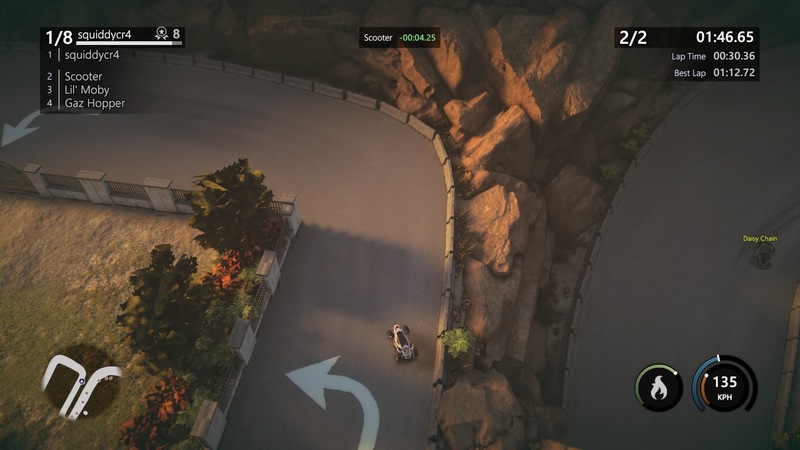 As a top-down, arcade-style racer the template was already set for the game, they’ve been making this type of thing for over thirty years with the most famous examples being Super Sprint and Super Off Road. 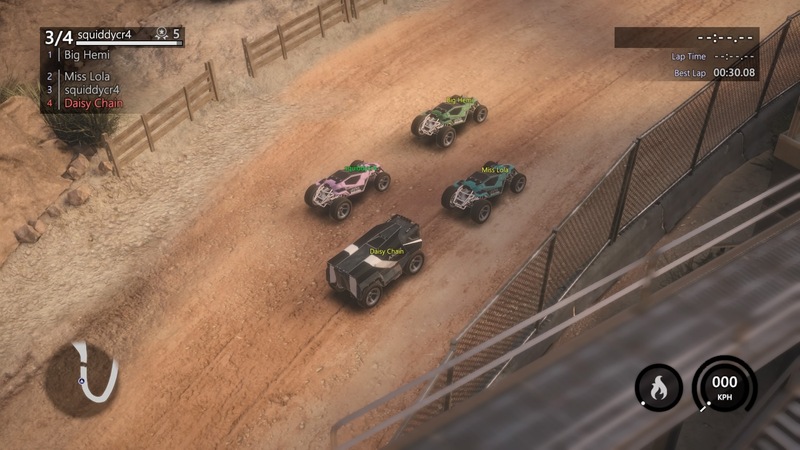 It’s quite a hard genre to mess up and now, a week later, Mantis Burn Racing arrives again offering top-down racing action but this time doing all the right things. Nothing spectacular, or particularly original, but just getting the basics right. 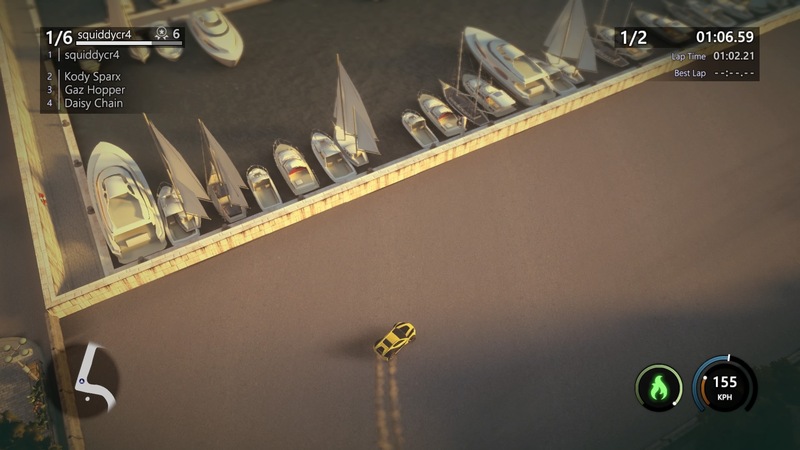 The game offers the usual career, single race, local multiplayer and online racing modes. Career Mode is where the meat of the singleplayer experience is at and it gives you seasons of events to get through with various race types and an ever-increasing level of difficulty. The seasons are set out in a semi-linear layout and can be replayed if you want to increase your position on them. The variation here is good, standard kind of fare. 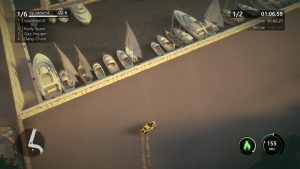 From ordinary races to elimations, score attacks (where drifting and drafting is the key to success), time trials and mini-leagues, there’s plenty to do and they all work well and as expected. To keep things interesting, each event comes with a series of bonus challenges (such as hitting a particular top speed or getting a certain amount of air during a race) with unlock ‘gears’ and while the challenges tend to mostly just unlock without you doing anything beyond trying to win the race, occasionally you might need to go out of your way to beat them. Gears are then spent on new vehicles and upgrades to existing ones. These have a pretty immediate effect, taking you from last place to first place in successive race attempts sometimes, so it is all quite well managed but the difficulty of certain events can be a bit of a spike and so you’ll wonder how well balanced it really all is. Sometimes I wonder if you’d be better off just setting the difficulty on each race on a curve rather than complicating it with various upgrades. But that’d get boring pretty fast, so the upgrade system is understandable. Where these games usually have the camera fixed to the track, this time the top-down view is locked above your car with your steering essentially rotating the screen, if that makes sense. It takes no time at all to get used to though and as you make your way through the various tracks, the turning and drifting feel very intuitive. Even on skiddy dirt tracks, you have a good sense of control while feeling nice and loose at the same time. 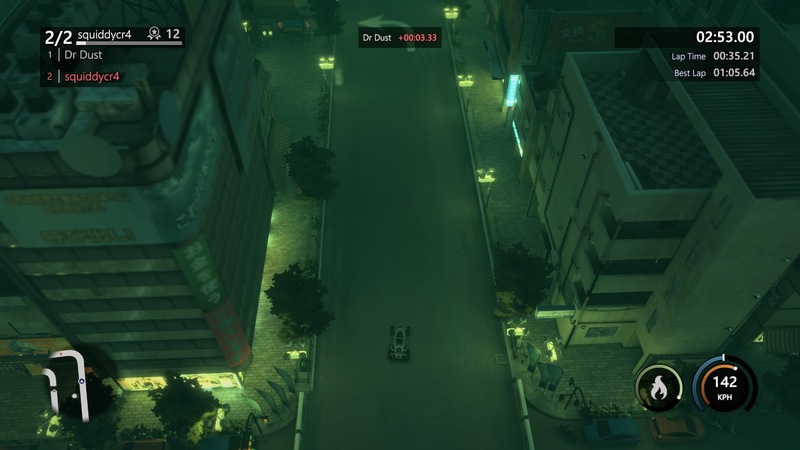 As Grand Prix Rock’N Racing found out to its cost, if you get that wrong, everything is lost and thankfully here, the physics are realistic enough to be credible but don’t punish you like that game did. Also, there’s a good sense of speed and excitement. While it is nice to see an indie game that supports online play, something of a rarity these days, the online mode was entirely deserted on day one, so don’t expect to get much out of this unless you can convince friends to buy in. They probably won’t though, so bear that in mind if you’re looking for online larks. The game looks pretty good. There is a level of detail to the tracks although the cars themselves are a little too basic. 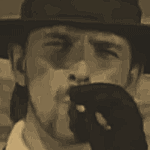 It all moves nice and fast with the action being easy to follow, so there are no complaints there. The scenery around the tracks is a little dull and the colour scheme is often a little bland but there are occasionally some okay views that fly past. Not that you’ll notice them as you’ll be keeping your eyes fixed firmly on the road ahead. Mantis Burn Racing doesn’t get much wrong at all. The core driving feels right and that’s the main thing and this will be a game that you can return to over and over, especially if you have friends over. Likewise, it isn’t going to set the world alight either but having seen this genre be executed entirely wrong last week, it’s good to see it done so competently now. - Doesn't push the genre forward - Don't expect much competition online - Camera angle options are all pretty samey. 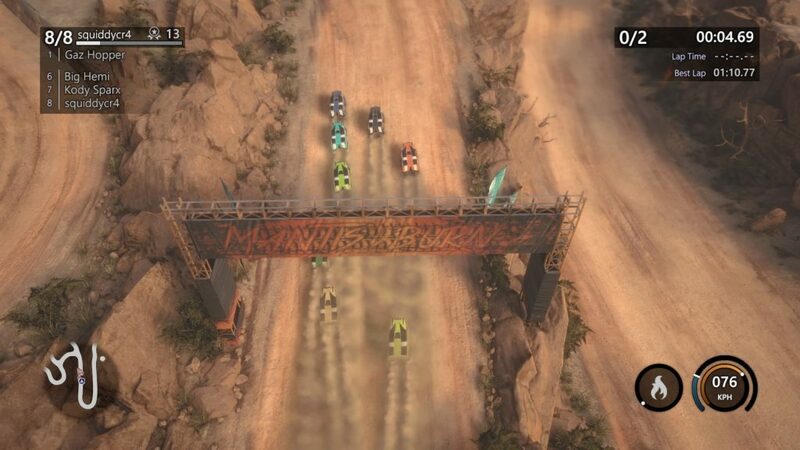 Mantis Burn Racing is a good example of the kind of arcade style racing that we wish was still popular. It has a lot to offer, if it can only get an audience, and while it may end up being more of a single player experience, the handling and track design make this a very worthwhile purchase for arcade racing fans.